Most of you know we've had some weird weather in the last 24 hours. Ski Patrol just gave me an updated report since we did not have groomers on the mountain last night (and subsequently no stake reading). We received 7" on top total out of this storm. Our base is at 46". There was no snowfall on the lower half of the mountain. Instead we got rained on. This leads many people to believe that conditions are marginal at best. Well I'm heading out right now to debunk this myth! 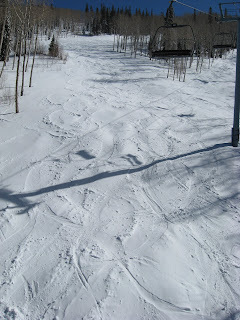 I'm going to go take honest photos of several different runs so you can see exactly what it looks like (past our webcam). I'll post the pics and soon as I get back inside. UPDATE: It's great skiing out there! The snow is soft and really fun to carve. I didn't see any of what we call "cancer spots"- areas where dirt is showing and can quickly spread. 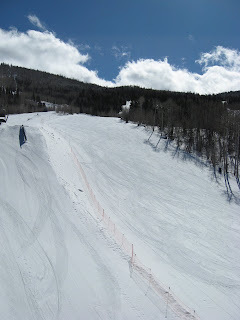 Just one point- Equalizer and Upper Snowcloud have been getting groomed about every other week lately. 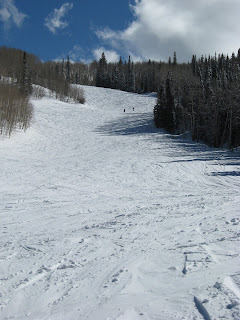 We wish that you would groom all the intermediate runs during the week (daily). You raised season pass prices and daily lift tickets but have groomed less than ever this year. We won't come up until you groom more. After the rain, it isn't safe to ski. 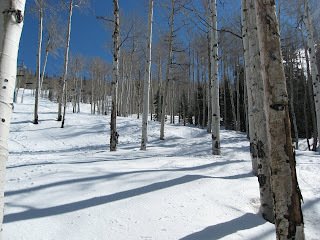 i was up on monday, and the skiing was really good. sure i was a little wet, but i had a smile on my face. hey, j.p., go ski vail or something so you can overanalyze the conditions with the yuppies. The grooming schedule lately has been dictated by temperatures and weather. Obviously both are out of our control. When it's too soft and warm, the crew doesn't go out so that we can protect the snowpack. It's hard to maintain a grooming schedule that makes everyone happy. For every comment we get asking us to groom more, we also get comments asking us to groom less. 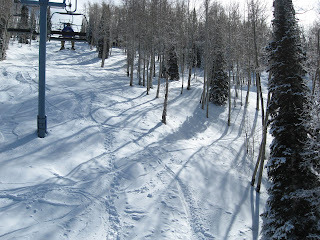 We try to maintain a balance for our guests and provide the best snowpack within our means. Hope that helps explain a little! Comments, questions, etc are always welcome. 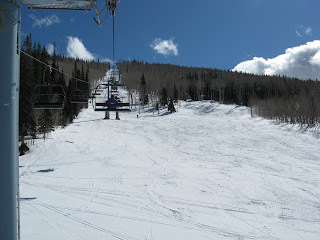 pretty crappy snow the whole season so far, and the park stunk too. I wish i could get my money back for my pass since they cost so much.